When mysterious epidemic spread throughout the world, John lost everything; his family, friends and his future. Only Michael, another survivor and his protector, kept him from giving up. Nine months later, things are looking bleak as they begin to run out of food and supplies, and are constantly assailed by an horrific threat that comes in the cover of night. When they come unexpectedly upon Karina, another survivor, the three of them are caught in a conflict far worse than they could've imagined. 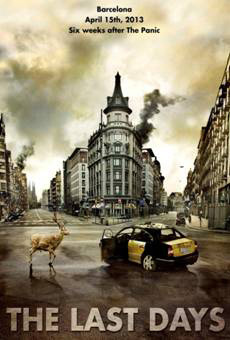 Not released in UK cinemas and heading straight for DVD after a screening at Frightfest 2013, The Last Days [Los últimos días] is a Spanish blend of Science fiction, thriller and the supernatural that deserves to find a wider audience. Directed by siblings David and Àlex Pastor, whose previous film Carriers (2009) was also based around the consequences of a viral pandemic, the film was described by Screenjabber as "a visually arresting addition to the sub-genre with more heart than most." The Last Days will be released on UK DVD on 24th February 2013 by Metrodome Distribution at the RRP of £15.99. No extra features have been listed, but we at least have the trailer. There are no English subtitles, so it's just as well there's almost no dialogue.